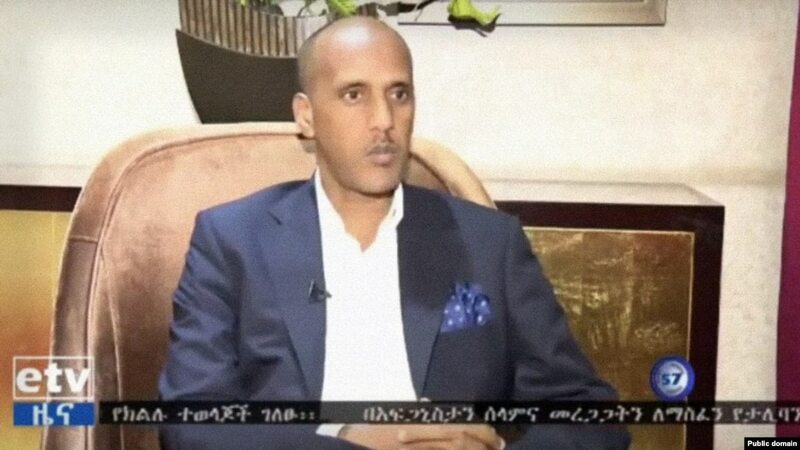 Mustafa Omer, the newly nominated acting president of Ethiopia’s Somali region, sits down for an interview with ETV, a state broadcaster. The dramatic turnaround comes less than three weeks after federal forces stormed the regional capital, Jijiga, and forced the previous regional president, Abdi Mohamoud Omar, also known as Abdi Illey, to step down. With no political experience and no mandate from the 4.5 million people he will lead, Mustafa faces formidable challenges addressing ethnic tensions and balancing Somali peoples’ desire for self-determination with their role within Ethiopia’s federalist government. But Mustafa’s popular rhetoric and personal history have raised hopes that he’s the right person to lead the Somali region through a period of challenging transition. Mustafa, an iconic activist, told VOA’s Somali service that he will prioritize human rights in his new role. “Since 1954, when the region came under Ethiopian rule, there was no democracy and human rights,” Mustafa said. Mustafa added that he plans to create space for dissenting voices critical of his administration. “Expectations are genuinely high. People feel that he’s the right man for the job at this time,” Juweria Ali, a doctoral candidate in Politics and International Relations at the University of Westminster in London, told VOA. “There’s a lot of things to clean up,” Juweria added. In the Abdi era, violence, displacement and imprisonment touched many Somali people’s lives. For 10 years, Abdi ruled the Somali region as a warlord, punishing critics with impunity and overseeing the Liyu police, a special force that human rights groups say committed atrocities and agitated ethnic violence, particularly between Somalis and Oromos, Ethiopia’s largest ethnic group. Earlier this week, Human Rights Watch called for an extensive, independent investigation into years of abuses, human rights violations and war crimes to redress wrongdoing and hold perpetrators accountable. Mustafa has long been an outspoken critic of Abdi Illey’s policies, and that has made him a target. Years ago, Abdi threatened to harm Mustafa’s family if he continued to criticize the government. Mustafa refused to stay quiet and, in 2016, his brother Faysal, an engineer, was killed. The family was coerced into saying Faysal took his own life, Juweria said. Their property was confiscated, and they were forced to flee to Kenya. Mustafa, 45, also fled. Prior to his selection as acting president, he had been living in Somalia, where he’d been working with the United Nations for the past few years, Abdinasir Mohamed Abdullahi, an attorney in Minnesota and close friend, told VOA. Other critics of Abdi’s regime have faced similar consequences. “[Mustafa] effectively symbolizes thousands like himself who had to flee and whose families had to flee because of their outspokenness against Abdi Illey,” Juweria said. Those deep personal ties have left some who follow the region wondering if Mustafa will use his newfound role to exact revenge, hunting down those loyal to the old administration. But Mustafa said retaliation doesn’t have a place in his reform agenda, and close friends don’t think it’s consistent with his character. “Based on my personal views, [what’s happened] will not have an impact on my administration. As a human being, I can love and hate someone, but that has no effect on my administration. What was existing before me was a kind of kingdom, which we need to terminate,” Mustafa said. Now, he added, the regional government will promote togetherness through peace and unity. A map of Ethiopia, with the Oromia and Somali regions highlighted. Clashes along the regional border, and ethnic tension between Oromos and Somalis, have resulted in mass displacements. Mustafa Omer, the new acting president of the Somali region, hopes to find a path to reconciliation. Senior leaders of the Ethiopian Somali People’s Democratic Party (ESPDP) unanimously selected Mustafa, an economist, after meeting in Ethiopia’s capital, Addis Ababa, for several days. It was an unlikely pick. Mustafa doesn’t belong to the party, nor does he have any prior experience in politics. Some in the Somali region see his selection as another example of the federal government encroaching on Somali sovereignty. ESPDP doesn’t belong to the ruling coalition, the Ethiopian People’s Revolutionary Democratic Front. But the EPRDF created ESPDP in 1998, and some in the region see it as an extension of the federal government’s interests. One particularly vocal critic has been the Ogaden National Liberation Front, a political party and armed group that, earlier this month, declared a ceasefire against what they term the “Ethiopian Security Apparatus” in the region. Rights groups have also accused federal forces of committing war crimes. ONLF enjoys a good deal of support, and Mustafa will need to engage with the group to be successful, Juweria said. Discussions about identity and autonomy will propel those talks. Mustafa met with an ONLF delegation in Addis Ababa Saturday, and the sides appear ready to move forward together. Questions of identity, ethnicity and nationality permeate Ethiopian politics. An ethnic-federalist approach to government, in which political parties based on ethnicity represent regions within a national parliament and executive coalition, has held the country together for nearly 30 years. But ongoing conflicts and underrepresentation have raised doubts about the viability of the model. Secessionist groups such as ONLF have pushed for independence, and the powerful central government has, at least until recently, maintained stability through violent crackdowns and suppression. Mustafa, like the country’s new Prime Minister Abiy Ahmed, represents a decisive departure from the old way of doing things. Improving relations between Somalis and Oromos is one of Mustafa’s priorities. New political players like Mustafa have created an opportunity for change, but the issue of identity has not been fully settled. Abiy, an Oromo, has underscored respecting differences and empowering Ethiopia’s many ethnic groups, while emphasizing shared Ethiopian values and identity. Mustafa, on the other hand, has prioritized Somali identity, saying on social media this week that Somalis will no longer allow their heritage or identity to be compromised. “Our historical, cultural, social, economic and political ties to the Somali race across the Horn of Africa region is a fait accompli. No one can change it or wish it away,” Mustafa wrote on Facebook. “We will therefore embrace symbols of Somalinimo no matter what angry oppressors say,” he added. A complex clan system within the Somali region further complicates matters of identity and efforts toward reconciliation across Ethiopia’s diverse populations. But Juweria is optimistic that Mustafa will be able to build bridges across long-standing divisions and animosities.